The iframe widget allows you to embed a URL or iFrame code in your MOBIT page. 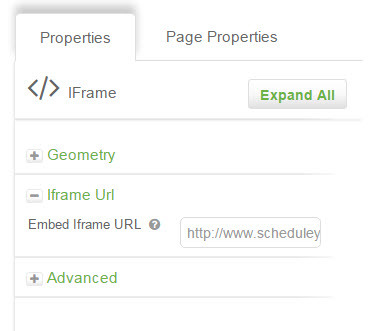 2 - Paste your iframe code or URL into the Embed iframe URL propeties section. MOBIT will reformat you iframe code to only include the URL portion of the code. For example, <iframe src="//www.appointmentcore.com/app/freeslots/iIADhq?iframe-view=SlotsV2" width="400" height="400" frameborder="0"></iframe>, becomes http://www.appointmentcore.com/app/freeslots/iIADhq?iframe-view=SlotsV2. When using a URL, simply paste the page URL into this section. The iframe widget opens up endless possibilities for what you can have on your landing page, however, here are a couple of ways we use this widget.